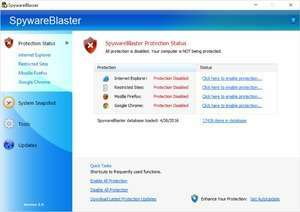 SpywareBlaster is an Internet Browser utility which provides a vaccine against some of the nasty malware out there on the web. It specifically deals with malicious ActiveX controls, cookies and restricts access to known dangerous web sites. After updating the program post-installation, you are ready to apply the filters you wish to activate for a safer browsing experience. These filters apply to Firefox, Internet Explorer, Chrome and a few other browsers. Version 5.5 is a freeware program which does not have restrictions and it's free so it doesn't cost anything. For security reasons, you should also check out the SpywareBlaster download at LO4D.com which includes virus and malware tests. Additional screenshots of this application download may be available, too.